Bacon Avocados, Oranges, Mandarins, and Blood Oranges from King and King Ranch in Fillmore, CA (not certified organic, but no spray). Bacon Avocados, Oranges, Mandarins, Limes, Lemons from King and King Ranch in Fillmore, CA (not certified organic, but no spray). Bacon Avocados, Grapefruit, Mandarins, Limes from King and King Ranch in Fillmore, CA (not certified organic, but no spray). Avocados and Limes are from King and King Ranch in Fillmore, CA. They are not certified organic, but are no spray. Fuji Apples and Crimson Sweet are from Cuyama Orchards in the Santa Ynez Valley. They are certified organic. Keep the farm going through the end of 2013...Order your CSA subscription today, buy a gift certificate for a friend or family member, visit us at the farmer's markets this weekend to get gifts of Salsa, Kale Chips, Beets and more for your friends and family! ~ If you are purchasing a CSA box, thinking about paying a little extra (maybe $25 this week instead of $20 or $19 instead of $15). 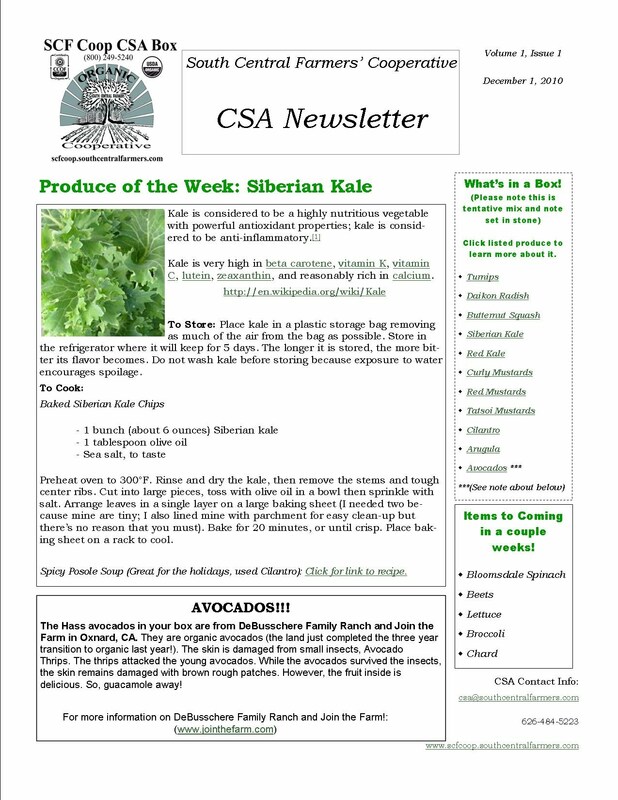 ~ Order your own CSA subscription right now, for the 2014 new year. ~ Visit us at the following Farmer's Markets this week to purchase great value-added gifts! Click Here to Order. SCFC would not be here today without everyone's continued support. Thank you all again for your commitment to local food systems and supporting small organic farmers. Wishing everyone a lot of joy, love, and fresh veggies! - There will be no CSA Deliveries Wednesday, December 25th and Thursday, December 26th and Wednesday, January 1st and Thursday, January 2nd. - There will be no CSA deliveries the weekend of Saturday, December 28th and Sunday, December 29th. Please stay tuned for any other possible changes. The South Central Farmer's Cooperative is partnering with Good Eggs LA to offer home delivery to its subscribers. Visit Good Eggs LA's website to see if they deliver in your area (they are expanding, so if they are not in your area, contact them to find out when). You will make your order through Good Eggs LA. As you will note, the cost of the box is higher due to the nature of home delivery...but it comes directly to you! Also, you can order other items to add to your basket that other farmers and food crafters produce. Avocados are from King and King Ranch in Fillmore, CA. They are not certified organic, but are no spray. Fuji Apples are from Cuyama Orchards in the Santa Ynez Valley. They are certified organic. Crimson Gold Apples are from Cuyama Orchards in the Santa Ynez Valley. They are certified organic. Pomegranates and Avocados are from King and King Ranch in Fillmore, CA. They are not certified organic, but are no spray. Citrus is from Heath and Lejune Organic Wholesalers. Citrus is from Heath and Lejune Organic Wholesalers. Avocados from King and King Ranch in Fillmore, these are not certified organic. Blueberries are from Heath and Lejune Organic Wholesalers. Strawberries and Lemons are from Heath and Lejune Organic Wholesalers. Pears and Lemons are from Heath and Lejune Organic Wholesalers. Strawberries are from Heath and Lejune Organic Wholesalers. Grapefruit and avocados from King and King Ranch in Fillmore, CA (non-organic). Organic White Peaches, Yellow Nectarines, Apricots and Crimini Mushrooms are from Heath and Lejune Organic Wholesalers. Grapefruit and avocados from King and King Ranch in Fillmore, CA (non-organic). Organic White Peaches, Yellow Nectarines, and Crimini Mushrooms are from Heath and Lejune Organic Wholesalers. Organic Lima Beans from DeBusschere Ranch in Oxnard, CA. Tangarines and avocados from King and King Ranch in Fillmore, CA (non-organic). Organic White and Yellow Nectarines are from Olson Family Farms near Fresno. Organic Lima Beans from DeBusschere Ranch in Oxnard, CA. Tangarines and avocados from King and King Ranch in Fillmore, CA (non-organic). Organic Strawberries from Heath and Lejune Organic Wholesalers (sourced from Coke Farms in San Juan Bautista). Organic Lima Beans from DeBusschere Ranch in Oxnard, CA. Tangarines and avocados from King and King Ranch in Fillmore, CA (non-organic). Mandarins and avocados from King and King Ranch in Fillmore, CA (non-organic). Strawberries come from Santa Maria, CA by way of Heath and Lejune Organic Wholesellers. Bacon avocados from King and King Ranch in Fillmore, CA (non-organic). Bacon Avocados, Blood Oranges, Gold Nugget Mandarins are from King and King Ranch. They are not certified organic. Bacon and Zutano Avocados and Gold Nugget Mandarins are from King and King Ranch. They are not certified organic. Bacon and Hass Avocados and Gold Nugget Mandarins are from King and King Ranch. They are not certified organic. Blood Oranges are from King and King Ranch. They are not certified organic. Avocados, Satsuma Mandarins, Grapefruits are from King and King Ranch. They are not certified organic, but the ranch is in the process of transitioning to organic. Avocados, Limes and Oranges from King and King Ranch. They are not certified organic, but the ranch is in the process of transitioning to organic. Hachiya Persimmons (Wednesday and Thursday boxes only) - see tips below. Avocados, Persimmons, and Pomegranate from King and King Ranch. They are not certified organic, but the ranch is in the process of transitioning to organic. Avocados and Oranges from King and King Ranch. They are not certified organic, but the ranch is in the process of transitioning to organic. Persimmons and Pomegranates from King and King Ranch. They are not certified organic, but the ranch is in the process of transitioning to organic. Apples from Heath and Lejune Organic Wholesalers. Pomegranates from King and King Ranch in Fillmore. Pineapple Guavas and Apples from Heath and Lejune Organic Wholesalers. We are running out of small boxes...so if you receive a box that seems a little empty is has the same amount of produce as all our other boxes this past week, it is just in a larger box. Thanks for understanding! For those of you who did not get any squash or purple basil in previous weeks...this is the week to order your box. It has been confirmed and will be in the boxes this week! Citrus and Avocados from King and King Ranch. Veggies come from SCF, Join the Farm! and Tutti Frutti Farms. Oranges and lemons come from Sespe Creek Organics in Fillmore. Other Citrus and Avocados from King and King Ranch. We currently have a lower number of veggies from our farm in the box because of our recent move and the winter climate (as some of you may be able to tell). In order to make sure to provide you the quality, quantity and variety that we strive for in every box, SCF will be including produce from other local farms we connect with. The information as to where your produce is coming from will be listed next to the item. Also, different days will have different varieties of produce and we will do our best to stay as accurate to each deliver days as possible. We continue to use organically grown produce. Thank you for your support and understanding! Other Citrus and Avocados from King and King Ranch (see their info in our News from the Farm Section). We are currently very low veggies growing on our land because of our recent move and the winter climate (as some of you may be able to tell), in order to make sure to provide you the quality, quantity and variety that we strive for in every box, SCF will be including produce from other local farms we connect with. The information as to where your produce is coming from will be listed next to the item. Also, different days will have different varieties of produce and we will do our best to stay as accurate to each deliver days as possible. We continue to use organically grown produce. Thank you for your support and understanding! Oranges comes from Sespe Creek Organics in Fillmore (see highlight below) and Lemons from Eco-Farms in Temecula. Please know that we are transitioning from winter to summer items, which means we are "gapping." The winter items are bolting, which means growing so fast that they are flowering and tasting bitter. This is due to the heat. It is also not quite warm enough for our summer items to grown in abundance. We are trying our hardest to keep the boxes full, but may also try to supplement them with fruit and other items while we are experiencing this period of the season. Our hope is that the as the bounty grows, the abundance of boxes in the summer will offset the smaller amounts during this time. Please note that this is a tentative list and subject to change based on the amount harvested before drop off. Week of May 26th, 2010 - A mix of the following will tentatively be in your box this week...We are currently transitioning from the winter season to the summer season. THX! Week of May 13th, 2010 - What may tentatively be in your box this week...We are currently transitioning from the winter season to the summer season, so bare with us as we have less of some items and more of another. THX! Week of May 5th, 2010 - What may tentatively be in your box this week...We are currently transitioning from the winter season to the summer season, so bare with us as we have less of some items and more of another. THX! Week of March 14th, 2009 (a mix of any of these veggies will be in your box) -- Sorry for the abundance of greens (lots of iron! ), we are in between harvests...red lettuce, carrots, and onions are in the works.